NON 2.0T CARS LIKELY USE THIS KIT. ROTORS ARE 11.7IN DIAMETER. 2.0T EQUIPPED VEHICLES LIKELY USE S4KF1342 WHICH USES 12.6IN DIAMETER ROTORS. 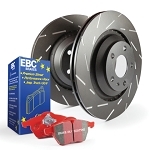 EBC Slotted USR Series rotors with Red Stuff pads. EBC USR Ultimax Series sport rotors offer quiet performance. Precision-machined using premium-quality castings, these super-quiet slotted sport rotors feature a narrow-profile slot pattern that cools and de-gasses brakes and eliminates air noise. Ultimax sport rotors also remove gas, dirt, water, and debris, while providing parallel pad wear for improved braking. And, their black GEOMET finish helps them to resist corrosion. Find the model designed for fitment on your vehicle. When noise is a concern, choose the quiet performer—EBC USR Ultimax Series sport rotors.